In 1797 Arthur Aikin described a clay mill which was adjacent to the smelting works near the present day Craig yr don housing estate. 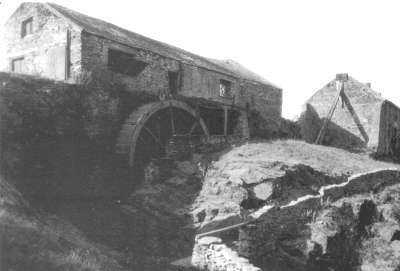 ” Adjoining to the smelting houses is a rolling mill, upon the same construction as malt mills, for grinding the materials for fire bricks: these consist of fragments of old brick, with clunch procured from near Bangor. An area on the hill to the East above the quay is still called the Brick pool. This was formed when clay was removed to form bricks. The type of clay is unsuitable for use as fire bricks in the local smelters however it could have been used to make bricks for the precipitation ponds on the mountain. It is thought that the industry finished some time prior to 1828. A candle factory was located in School lane next door to the Wheatsheaf public house. 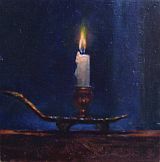 The candles were in great demand, both for use in the mine and at home until paraffin lamp and later gas lighting became available. The candles were made of tallow and not bees wax. The tallow was collected each market day from the farming people who came into town. This was sodium alginate which was manufactured from sea weed. It uses was to clarify the beers in the brewery. Sea weed was also collected and sent in ships from Amlwch as early as 1775. When burnt the sea weed provided potash and iodine which was used in the manufacture of Alum and glass. Built in 1816, and standing over 60 ft. high, the imposing brick and stone tower of Melin y Borth overlooks the harbour of AmIwch Port. 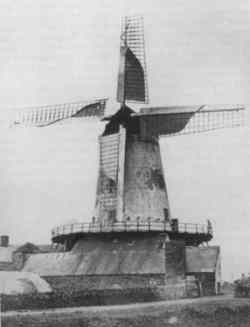 With seven floors and 4 sets of grinding wheels, it was the tallest windmill to have been built on Anglesey. Erected by the prominent Paynter family, it was able to grind 70 bushels of corn in an hour. Although Melin Y Borth was owned by the Paynters, its day to day running was, for many years, was carried out by the miller, William Jones of Queen Street. William Jones continues to appear as miller of Melin y Borth in various Directories until 1895, not long before its closure. There were other mills at Pentrfelin and a water mill at Melin Adda. In the later 1800s some of these windmills were so important for corn grinding that they were fitted with steam engines to ensure that they could operate on still days. Marram grass was initially planted on the west of the island to prevent the movement of coastal sands. 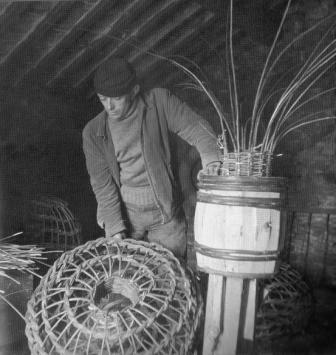 The long strands of marram grass were found to be ideal for making mats. The grass was cut at the end of Summer and allowed to dry for a few weeks. 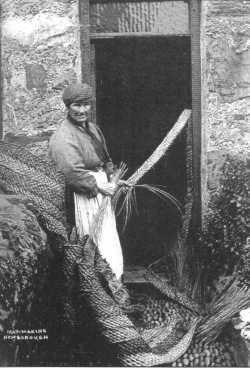 These sheaves were plaited together, eight Welsh yards (a welsh yard was about a metre) made a thong of lace (carrai) and eight thongs were needed to make one mat. When rope became available many years later the mat making tradition was carried on using the new material. Many rope mats were used at Parys mountain. The drillers knelt on rope mats while they were making their holes prior to filling with dynamite. The mats were also used as a filter during the process of washing copper ore. Sailors and sailor’s wives also made mats for decoration. On 27/2/1875 an agreement was signed between William Thomas the ship builder and a Evan Evans of Waun fawr, Caernarvon to become joint partners in the “Evan Evans Soda Water manufactory” based at Pant rhyd talog in Amlwch port. William Thomas was to be a “sleeping partner” while Evan Evans was paid 30/- per week to work full time for the venture. A plant was established and water was bottled and sold all over Anglesey. Some even being sold at Port Dinorwic on the main land. However, the venture was never a commercial success. William Thomas withdrew from the company. The company survived until it was put into voluntary liquidation on 10/1/1880. A printing press was established by David Jones in Wesley street about 1864. Around 1881 he printed a travel book called “Amlwch, Bull bay and Neighbourhood”, which was published by J C Roose. The printing press remained in operation until 1891 and many books and ballads were published. (There are 4 sawyers listed in 1851 census)The shipping industry needed wood and a water wheel driven sawmill owned by the Paynter family existed on the West bank of the port. The remains of the saw mill can be seen in this photograph taken in 1932. Towards the end of the 19th century there were 5 timber yards in Amlwch all producing work for the shipping industry. In 1869 the “North Anglesey Slate and slab Co” was formed to work the hard rock close to Point Lynas. A new harbour and port to be named “Port Dinorben” was planned. But the company had stopped working by 1876. In 1804 during the Napoleonic wars, the admiralty installed signal stations along the North Wales coast to warn of a surprise attack by the French on Liverpool. The signal station on Mynydd Elian (1808) ( SH480932) was typical of others in the chain. It was a wooden hut with a flagstaff. The Morning Post (London, England), Thursday, January 01, 1835Liverpool, The day throughout has been much too thick and foggy to permit any communication passing through to Holyhead from this station. The officers of the stations were issued with signal flags. They would use these to signal to any ships that they saw out to sea.. The ships needed to give the correct signal response or they were assumed to be French vessels. If the correct response was not received the signal stations would send a signal to Liverpool and all naval ships in the area would then prepare to engage. By 1826 a new signal system based on a single mast with three pairs of semaphore arms had replaced the flag system. 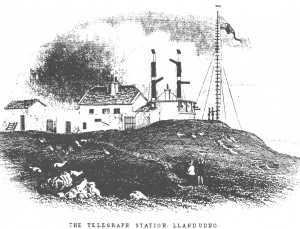 By the 1830s a solid telegraph building as depicted in the picture below had been built. This building was then rebuilt in 1841. However by 1860 both the semaphore and electric telegraphy was moved down to Point Lynas lighthouse (SH 478922) . Each of the arms on the semaphore mast were 7 1/2 feet long. The relative position of the arms on the mast spelt out the message. The merchant sea shipping companies used the new system to obtain information about their ships as they rounded Holyhead. This allowed them to make arrangements for the ship take a Pilot on board for the difficult journey to the docks at Liverpool. The signal man at Point Lynas was called Griffith Michael. He was appointed on 14/8/1827 and by 1837 was earning £55 pa. He retired with a 12/- per week pension in1852. He died 24/8/1854 and is buried in St Eilian Church yard. By the mid 186o s the use of semaphore telegraph system to Liverpool merchant ships had been abandoned due to the arrival of the faster and more accurate electric telegraph system based on an undersea cable. By 1901 William Kaney 57 was Principal lighthouse and telegraph keeper with Charles Stanford and Robert Eccles to assist. The coastguard and admiralty continued to have a semaphore station at Point Lynas until 1907. (Thanks to Faster than the wind. Frank Large for the information on the telegraph system). By the late C18th Liverpool had become a very important port and because of the dangerous entrance it was decided that a Pilot service was required with a station on Anglesey shores. In 1766 a committee visited Point Lynas and because of an existing natural harbour from the strong South Westerly winds it was decided to build a small quay and pilots quarters. It was soon realised that a further window facing NE was required and the initial building was relocated to its present position on the headland and further improved in 1835 when a powerful steady light visible for 16 miles was installed. This was converted to a flashing light in 1839. ” 13 lamps and reflectors placed in bow window on inside of curved frame. the flash produced by boards turned by machine until their edges are towards the lamps then they close suddenly to turn out the lamp. The machinery is worked by pulling an endless chain manually hand over hand this raised a 75KG weight of lead through a pipe. Once released the weight sank down slowly turning the cogs of the timing mechanism for the shutters. This lead weight had to be lifted to the top of the pipe once every hour. Once this was done a manual pressure pump had to be operated 3 times a minute to maintain the paraffin pressure for the lamp. In the winter this work was carried out from 3 pm until 9 am the following morning. The present lantern of 15 feet diameter dates from 1874 while a fog horn was installed in 1948. In 1952 a battery system was installed and in 1957 this was replaced with main electricity. 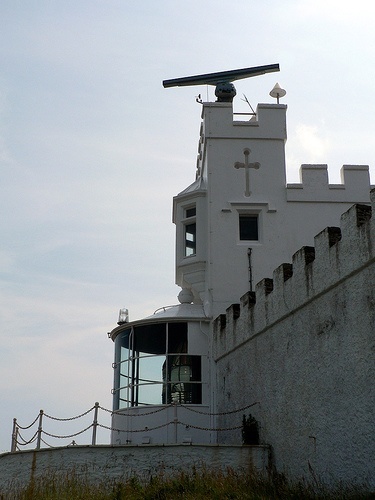 The Light house was taken over by Trinity House in 1973 and is now un manned and operated remotely. In 2001 the lease expired and the area is now owned by the Mersey Dock & harbour Company. now broadcast which allows shipping to navigate with an accuracy down to 1 metre. A woollen factory was in existence in 1866. The surrounding farms sent their wool to the factory to be converted into many different types of cloth. 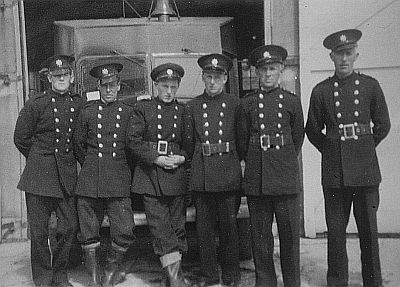 Amlwch’s first fire station was opened in 1948 and was located in a small building adjacent to the then ” Royal Cinema”. 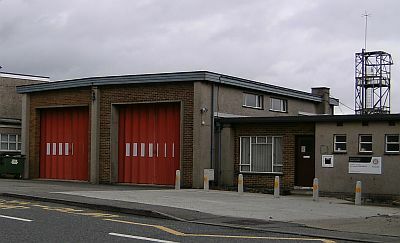 In 1954, the crew moved to the current premises.